Last Thursday the ACO released the official entry list for the 2009 edition of the 24 Hours of Le Mans, and it confirmed some pre-announced deals, verified some rumours and offered some complete surprises – as it does every year! I’m writing this quite late so I’m going to just do short notes. Audi are returning with a new car, which will be raced first at Sebring but will probably not contest the full 2009 season. I’m not sure if this is backup plan from Audi, but they’ve sold or loaned to R10s to Colin Kolles. They’ll still need to be adapted to the narrower rear wing regulations. Peugeot also return with three cars. An updated car and revised driver line-up should mean they are quietly confident ahead of this year’s race – but they said that last year. Count this is as a surprise. A customer Peugeot for Pescarolo. Surely this is in response to Kolles? It seems to be a 2008 car modified to new rules from what I’ve read, and not the ’09 cars of the factory team. Three entries also from Aston Martin, who are in a naming dispute with Lola at the moment. First year with these cars so a win surely isn’t on the cards, but they’ll be looking to show good speed. AMR Eastern Europe is Charouz, in fact they all might be, but this is the only one under the Czech flag. This entry seems to be being run more at ‘arms length’ from the factory/Prodrive. Can’t say I know much about this so I’m assuming it’s a continuation from last year. Zytek and Ginetta merged toward the end of last year and LNT have stepped up from running a GT2 Panoz (and they entered Petit with this car). Quick chassis, promising for the privateer sub-class. The Formula 3 team makes the switch to endurance racing. ‘Tis all I know. I’m surprised this only got one entry. Yay, Creation are back. I like them. Team Goh won overall with the Audi R8 a few years back, they’ve been absent for a while. Team Essex weren’t going to enter and changed their minds. Vitaphone are a surprise announcement, they run Saleens in FIA GT and did enter Le Mans last year with an Aston GT1 but a prototype wasn’t expected at all. RML are always strong. No idea who KSM are. This Lola is fast, I think it’s basically the P2 version of what Aston Martin are running. More Lola coupes for these guys but a choice of Judd engines instead. It’ll be an interesting battle between the four Lolas! Pescarolo with a Mazda engine? Fair enough.. I’m sure I read who Oak Racing are, it’s a name change of a team I know about but I can’t remember who at the moment. The P2 version of the P1 car above. ASM had a Lola last year. No idea. Seems like they have the previous version of the car ASM will run. I like this team too and the Radical is pretty quick. With no works Astons, guess who’ll win this class? This is the last appearance of works GT1 Corvettes though, so enjoy it. Back-up for a fight that never came. They weren’t going to enter after a fight with the ACO over the promotion of the LMS, but changed their minds last minute. Not to mention wanting to prove how pacesetters in European GT racing fair at LM. Two quick Astons may just push Corvette hard enough. Is it unkind to say these are field-fillers? This is probably the last year of GT1 in this spec. I know Ratel’s FIA World GT coming next year will run to different rules. Just three Porsches this year in GT2. I’m amazed, they used to dominate! Shame the Lizards didn’t get a second entry. Nine Ferraris!! I think that shows this is the faster car, as everyone gravitates toward it. Good to see that Drayson got an entry. You have to say they are aiming to score a finish, but that’s what Le Mans is about. Nice to see Spyker still plugging away but only one car this time. You’ll note I’m not tipping winners in any class (except GT1!). Frankly with this field it’s much too difficult to go picking winners this early, and with no Test Day it’s even harder. There are ten reserves this year as opposed to 8 in previous years. As always they’ll enter the race in this order should any of the above withdraw, regardless of class. So if a P1 drops out the first reserve, a GT2 this year, will take that spot. That answers where Epsilon Euskadi and Spyker’s second cars are, as well as several Porsches. How did Barazi and Larbre not get entries??? That’s nuts. I don’t think we’ve seen Welter on the list for a while.. Okay I think I’m done. Unfortunately I don’t have time to scout for more information, sorry, but I hope this was enough to work as a little primer. No doubt the boys at RadioLeMans.com will discuss this in great detail (along with more USF1 news and lots else) in tomorrow’s Midweek Motorsport which you can hear live at 8pm GMT / 3pm EST. I think it’s repeated at 8pm EST. If that’s not helpful, the podcast will follow on a day or so later. You need to count MWM as a ‘Must Listen’ even if sportscars isn’t your thing, ‘cos they cover all sorts of stuff. And of course there’s always the official website of the race. 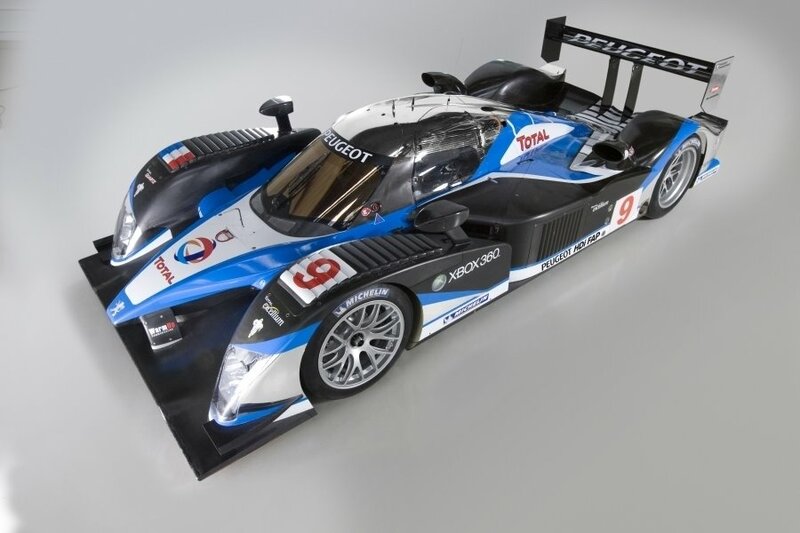 The 2009 edition of the Peugeot 908 was launched yesterday. The car looks substantially the same as last year, albeit with a rear wing 400mm narrower per the ACO’s regulations for this season. Pug’s engineers say they’ve been working on the engine mapping, cooling and traction control systems. Partly this is due to the new rules cutting power by 10% on last year, and partly this is because Peugeot really struggled with overheating last year. It cost them the win at Le Mans because the airflow when it was raining wasn’t sufficient to cool the engine. There were other factors as well of course, like their crazy tyre decisions and inexperienced drivers (many were new to sportscars, anyway), but the cooling was a major factor. Also in ‘cooling news’, the roof sports a ‘reflective chromelike aluminium covering’ according to Olivier Quesnel. A surprise announcement on the driver front, to me at least, was the unveiling of Sebastien Bourdais and David Brabham. Bourdais was rumoured on Thursday night, which was a surprise to me because nobody has dovetailed a full F1 season with an attack on Le Mans for many, many years. 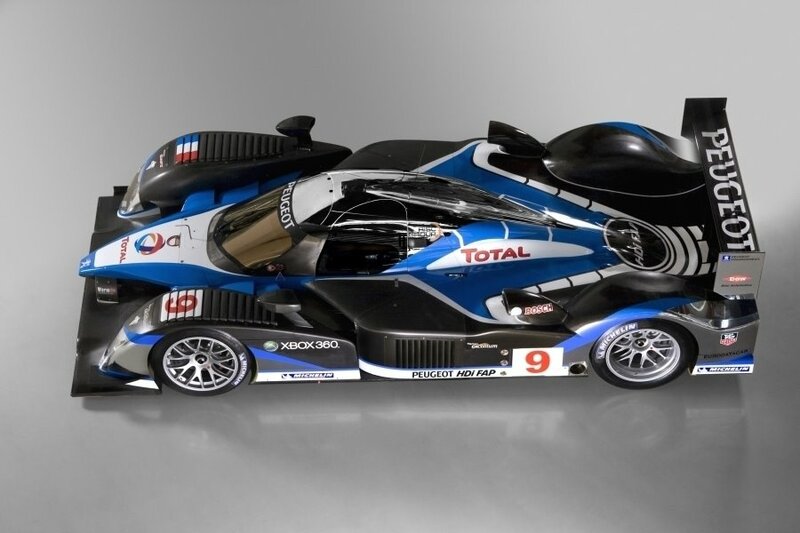 The last to try the F1/LM crossover was Franck Montagny (fairly recently too, say 4 years?) but he was just an F1 test driver. at the time. Brabs wasn’t on my radar at all for this, maybe I missed a comment on Midweek Motorsport (I’m still an episode behind) or other sources. I had thought he was still signed to drive the Acura and perhaps he is, which is why he won’t appear at Sebring. S Bourdais, D Brabham, M Gene, C Klien, P Lamy, N Minassian, F Montagny, S Sarrazin, A Wurz. It’s still a fantastic-looking car. Peugeot confirmed their plans for the first half of 2009: they will take two cars to the 12 Hours of Sebring in March, and three cars to the 1000km of Spa-Francorchamps in May before sending all three to Le Mans. There is no word on what will become of the team after Le Mans. In my opinion they’ll see what Audi does, and how they perform against Audi (and Aston!) in the big race. This leaves Gene, Brabham and Wurz for the 3rd car if the line-ups remain the same. Line-ups for Spa will be confirmed at a later date. PS – yes, I know I didn’t post about the new Acura. They aren’t going to Le Mans. Yet..
PPS – I’m begging you here, PLEASE get the name right. “Le Mans”. There are TWO WORDS. Writing “LeMans” (or “Lemans” which is worse) really does annoy me! I don’t mind it on Twitter because of the character limit. A pet peeve of mine, just like hyphenating ‘F1’.